The Myth of Uber for X | Intrinsic Investing | Intrinsic Investing is a publication of Ensemble Capital Management, LLC. Ensemble Capital is a registered investment advisor located in Burlingame, CA, midway between San Francisco and Silicon Valley. The firm currently manages approximately $915 million on behalf of private clients, charitable institutions, and a publically traded mutual fund. One of the most basic (both in the sense of “simple” as well as the slangy put down) start up pitches is “It’s like Uber for X!”. While this vocabulary has fallen out of favor in recent years, for a time it was a very common premise for new startups. Despite it falling out of favor, there is still a sense among investors that an app-based competitor might come out of nowhere at any time and destroy an established business or industry. We’ve seen this worry crop up in relation to our investment in Landstar Systems, a trucking logistics business, so I thought I’d lay out why Uber was a special case that doesn’t apply to long haul trucking and how investors should think of the Uber for X risk in the context of public market investing. Uber for X is short hand for a company that uses an app to connect two sides of a transaction. For instance, see this long list of on demand services listed under the heading Uber for X. It includes Cleanly (Uber for Laundry! ), VetPronto (Uber for Vets! ), Push for Pizza (Uber for Pizza!) and even Transfix (Uber for Trucking!) one of the many app-based trucking logistics companies that some investors view as a threat to Landstar Systems. However, none of these businesses appear to be tapping into the critical market feature that made Uber a roaring success. Uber wasn’t a success because they made an app. They weren’t a success because their app connected two sides of an existing market. They were a success because their app-based business model drew in a simply massive source of new supply, which caused prices to fall and triggered a surge of demand. This dynamic then kicked off a flywheel effect that transformed the entire industry. Pre-Uber, people took taxis. Taxi companies acted as matchmakers between the potential rider and an available driver. Uber did not simply replicate the matchmaking part of the process with an app, they entered a market with huge untapped potential supply (all the people who own a car and would like to make money either on the side or as a full time job) and made it super simple for that supply to enter the market. Critically, Uber didn’t need to convince drivers to make Uber their full time job. Instead, Uber allowed for drivers to provide transportation in whatever windows of the day they had available. Uber didn’t match riders with the existing transportation supply (taxi drivers), they matched riders with an entirely new source of supply. This upended the market, crushed prices to extremely low levels and utterly transformed the passenger transportation market. 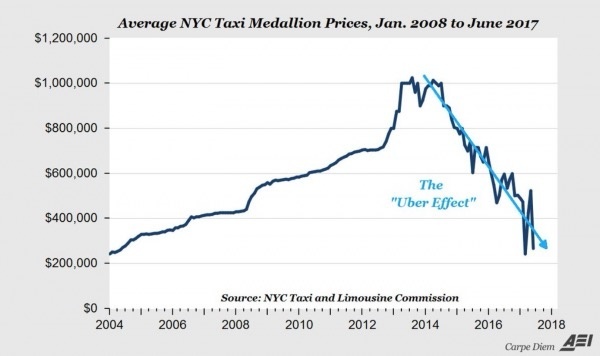 Here’s a chart of the value of taxi medallions. This is the chart that worries investors in incumbent businesses when they hear about app-based competitors emerging. One case of an Uber for X working out as promised is Airbnb. The company could easily be characterized as Uber for Lodging. And its success, just like Uber’s is based on the way the company did not simply connect people wanting to rent a room with existing supply (hotels), but instead by creating a massive new source of supply (people who have an extra room or spare apartment they don’t use all of the time). So what about Cleanly, VetPronto and Push for Pizza? These Uber for X businesses are offering an app that connects people who wear clothes with laundry companies, pet owners with veterinarians or hungry people with pizza shops. There is no reason to think that any of them will unleash a large pool of latent supply. There aren’t a bunch of people with veterinarian skills who just need a simple way to source clients to fill their spare time. There’s no big inventory of pizza ovens sitting underutilized. In the case of Transfix (or more credible competitors such as Conway or even Uber’s own Uber Freight business) there simply aren’t a bunch of underutilized big rigs in people’s back yards or a bunch of people who know how to drive big rigs and could do so in their spare time. So yes, apps offer a nice user interface. But simply creating “an app for that” doesn’t come close to creating a viable Uber for X business model. There are certainly real Uber for X opportunities out there. But the condition that needs to be met is you must find a market that has a large, underutilized source of supply (like Uber and Airbnb found) and offer a logistical interface that serves the needs of both the demand and the latent supply in such a way that unlocks the supply. These conditions don’t exist in the laundry, pizza or pet care business. They don’t exist in the long haul trucking market (although they may well exist in the last mile, home delivery business). And when these conditions don’t exist, any Uber for X business model isn’t actually replicating Uber at all and has little hope of success. As of the date of the post, clients invested in Ensemble Capital Management’s core equity strategy own shares of Landstar Systems (LSTR). This company represent only a percentage of the full strategy. As a result of client-specific circumstances, individual clients may hold positions that are not part of Ensemble Capital’s core equity strategy. Ensemble is a fully discretionary advisor and may exit a portfolio position at any time without notice, in its own discretion.